Cable transport is a broad class of transport modes that have cables. They transport passengers and goods, often in vehicles called cable cars. The cable may be driven or passive, and items may be moved by pulling, sliding, sailing, or by drives within the object being moved on cableways. The use of pulleys and balancing of loads moving up and down are common elements of cable transport. They are often used in mountainous areas where cable haulage can overcome large differences in elevation. Rope-drawn transport dates back to 250 BC as evidenced by illustrations of aerial ropeway transportation systems in South China. 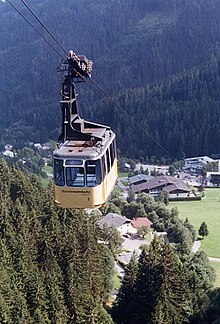 The first recorded mechanical ropeway was by Venetian Fausto Veranzio who designed a bi-cable passenger ropeway in 1616. The industry generally considers Dutchman Adam Wybe to have built the first operational system in 1644. The technology, which was further developed by the people living in the Alpine regions of Europe, progressed and expanded with the advent of wire rope and electric drive. The first use of wire rope for aerial tramways is disputed. American inventor Peter Cooper is one early claimant, constructing an aerial tramway using wire rope in Baltimore 1832, to move landfill materials. Though there is only partial evidence for the claimed 1832 tramway, Cooper was involved in many of such tramways built in the 1850s, and in 1853 he built a two-mile-long tramway to transport iron ore to his blast furnaces at Ringwood, New Jersey. World War I motivated extensive use of military tramways for warfare between Italy and Austria. During the industrial revolution, new forms of cable-hauled transportation systems were created including the use of steel cable to allow for greater load support and larger systems. Aerial tramways were first used for commercial passenger haulage in the 1900s. The earliest form of cable railway was the gravity incline, which in its simplest form consists of two parallel tracks laid on a steep gradient, with a single rope wound around a winding drum and connecting the trains of wagons on the tracks. Loaded wagons at the top of the incline are lowered down, their weight hauling empty wagons from the bottom. The winding drum has a brake to control the rate of travel of the wagons. The first use of a gravity incline isn't recorded, but the Llandegai Tramway at Bangor in North Wales was opened in 1798, and is one of the earliest examples using iron rails. The first cable-hauled street railway was the London and Blackwall Railway, built in 1840, which used fibre to grip the haulage rope. This caused a series of technical and safety issues, which led to the adoption of steam locomotives by 1848. The first Funicular railway was opened in Lyon in 1862. The Westside and Yonkers Patent Railway Company developed a cable-hauled elevated railway. This 3½ mile long line was proposed in 1866 and opened in 1868. It operated as a cable railway until 1871 when it was converted to use steam locomotives. The next development of the cable car came in California. Andrew Hallidie, a Scottish emigre, gave San Francisco the first effective and commercially successful route, using steel cables, opening the Clay Street Hill Railroad on August 2, 1873. Hallidie was a manufacturer of steel cables. The system featured a human-operated grip, which was able to start and stop the car safely. The rope that was used allowed the multiple, independent cars to run on one line, and soon Hallidie`s concept was extended to multiple lines in San Francisco. The first cable railway outside the United Kingdom and the United States was the Roslyn Tramway, which opened in 1881, in Dunedin, New Zealand. America remained the country that made the greatest use of cable railways; by 1890 more than 500 miles of cable-hauled track had been laid, carrying over 1,000,000 passengers per year. However in 1890, electric tramways exceeded the cable hauled tramways in mileage, efficiency and speed. The ski lift was developed by James Curran in 1936. The co-owner of the Union Pacific Railroad, William Averell Harriman owned America's first ski resort, Sun Valley, Idaho. He asked his design office to tackle the problem of lifting skiers to the top of the resort. Curran, a Union Pacific bridge designer, adapted a cable hoist he had designed for loading bananas in Honduras to create the first ski lift. When compared to trains and cars, the volume of people to transport over time and the start-upcost of the project must be a consideration. In areas with extensive road networks, personal vehicles offer greater flexibility and range. Remote places like mountainous regions and ski slopes may be difficult to link with roads, making CTP a much easier approach. A CTP system may also need fewer invasive changes to the local environment. The use of Cable Transport is not limited to such rural locations as skiing resorts; it can be used in urban development areas. 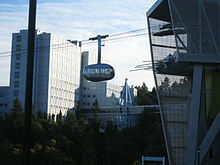 Their uses in urban areas include funicular railways, gondola lifts, and aerial tramways. On Wednesday 25 July 2012, passengers of a tour cable car were stuck 90 meters high in the air as there was a power failure which caused the cart to suddenly stop over the river Thames in the gondolas. The fault happened at 11:45 am and lasted roughly for 30 minutes. Luckily no passengers were injured, however, at the time this was the first problem to ever hit the Emirates Airline. Nevis Range, near Fort William, Scotland, a cable car was reported to have derailed and crashed to the ground seriously injuring all 5 passengers on 13 July 2006. Another car on the same rail also slid back down the rails when the crash happened. Following the incident, 50 people were left stranded at the station whilst the staff and aid helped the passengers of the crashed car. The cable car accident in Cavalese, Italy which occurred on 9 March 1976 is considered the worst aerial lift accident in history. The car crashed off the rails and fell 200 meters down a mountainside, also crashing through a grassy meadow before coming to a halt. The tragedy caused the death of 43 people, and four lift officials were jailed for charges regarding the accident. On April 15, 1978, a Cable Car at Squaw Valley Ski Resort in California came off of one of its cables, dropping 75 feet and violently bouncing up. It collided cable which sheared through the car. Four people we killed and thirty-one were injured. The Kaprun disaster was a fire that occurred in an ascending train in the tunnel of the Gletscherbahn Kaprun 2 funicular in Kaprun, Austria, on 11 November 2000. The disaster claimed the lives of 155 people, leaving 12 survivors (10 Germans and two Austrians) from the burning train. It is one of the worst cable car accidents in history. ^ Hewitt, W. (1909). The Bleichert System of Aerial Tramways: Reversible Aerial Tramways. Aerial Tramways of Special Design. Trenton Iron Company. p. 11. Retrieved July 9, 2018. ^ United States. Forest Service (1992). Tahoe National Forest (N.F. ), Sugar Bowl Ski Resort Master Plan: Environmental Impact Statement. p. 11–PA357. Retrieved July 9, 2018. ^ Kenney, Jim. "Firsthand Report: Squaw Valley – This Place Has the Goods". DCSki. Retrieved July 9, 2018. ^ Mitchell, A.W. ; Secoy, K.; Jackson, T. (2002). The Global Canopy Handbook: Techniques of Access and Study in the Forest Roof. Global Canopy Programme. p. 93. ISBN 978-0-9542970-0-8. Retrieved July 9, 2018. ^ Skiing Heritage Journal. International Skiing History Association. June 2004. p. 26. Retrieved July 9, 2018. ^ Smith, E. (2010). Black & Decker The Complete Guide to Backyard Recreation Projects. Quarto Publishing Group USA. p. 74. ISBN 978-1-61060-321-8. Retrieved July 9, 2018. ^ a b Dailey, Keli (3 October 2017). "Cable Car History". SFMTA. Retrieved 10 July 2018. ^ "Cable Ferries" (PDF). Retrieved 10 July 2018. ^ "What is a funicular railway?". HowStuffWorks. 14 November 2000. Retrieved 10 July 2018. ^ Aerial Tramways, Ski Lifts, and Tows: Description and Terminology. Forest Service. 1975. Retrieved 10 July 2018. ^ "How Elevators Work". HowStuffWorks. 12 February 2002. Retrieved 10 July 2018. ^ a b "Recent Developments in Cable-Drawn Urban Transport Systems" (PDF). mas.rs. Retrieved November 17, 2015. ^ "Early History" (PDF). oitaf.org. Retrieved July 9, 2018. ^ a b Information Center for Ropeway Studies (2006-03-17). "About Ropeways". Colorado School of Mines – Arthur Lakes Library. Archived from the original on 2006-09-04. Retrieved 2006-11-30. ^ Trennert, Robert A. (2001). Riding the Hire Wire. University Press of Colorado. ISBN 9781457109850. ^ Richards, Alun John (2001). The Slate Railways of Wales. Llanrwst: Gwasg Carreg Gwalch. ISBN 978-0-86381-689-5. ^ "The First Docklands Railway : The Story of the London and Blackwall Railway". Isle of Dogs Life. 13 July 2016. Retrieved 9 July 2018. ^ "First Funicular Railway" (PDF). Retrieved 11 July 2018. ^ First District, New York (State). Public Service Commission (1907). Report of the Public Commission for the First District of the State of New York. p. 455–456. ^ Thompson, Joe (1998–2004). "Who Was Important in the History of the Cable Car?". ^ Hughes, Stephen L. "San Francisco Cable Car – the gripping tale of an aged compact". www.cablecarmuseum.org. Retrieved 9 July 2018. ^ Harter, Jim (2005). World Railways of the Nineteenth Century: A Pictoral History in Victorian Engravings. JHU Press. ISBN 9780801880896. ^ Engber, Daniel (February 21, 2014). "Who Made That Ski Lift". New York Times. ^ "Classification by track" (PDF). witpress.com. Retrieved July 9, 2018. ^ "A new approach to urban transportation by cable" (PDF). oitaf.org. Retrieved July 9, 2018. ^ "Significant Social Effects" (PDF). Retrieved July 9, 2018. ^ "highest 3S cablecar". Zermatt Matterhorn. Zermatt. Retrieved 8 October 2018. ^ Faulks, R.W. (1999). International Transport: An Introduction to Current Practices and Future Trends. Taylor & Francis. p. 66. ISBN 978-0-8493-4083-3. Retrieved 10 July 2018. ^ "Other uses of cable transport" (PDF). oitaf.org. Retrieved November 17, 2015. ^ "CABLEWAYS AS URBAN PUBLIC TRANSPORT SYSTEMS". aetransport.org. Retrieved July 9, 2018. ^ "Passengers stranded 90 meters in the air as Londons new cable car breaks down". standard.uk. Retrieved July 9, 2018. ^ "Emirates Air Line Thames Cable Car breaks down". BBC.com. Retrieved July 9, 2018. ^ Gillan, Audrey (13 July 2006). "Four hurt as cable car derails on Nevis range". the Guardian. Retrieved 9 July 2018. ^ "Five injured in Highlands cable car accident". scotsman.com. Retrieved 9 July 2018. ^ "People injured in cable car crash". Archived from the original on April 30, 2008. Retrieved January 12, 2015. ^ "California Cable Car incident". tahoequarterly.com. Retrieved July 9, 2018. ^ "Worst cable car accident in history". skimagazine.com. Retrieved July 9, 2018. ^ "Kaprun Disaster". BBC.uk. Retrieved July 9, 2018. "Cable cars: Danger in the skies". BBC News. June 1, 1999. Retrieved July 9, 2018. Wikimedia Commons has media related to Cable transport.